Entries from Digital Intelligence tagged with "myspace"
Tumblr and MySpace passwords hit by "mega breach"
Hundreds of millions of hacked account details from social networks MySpace and Tumblr have been advertised for sale online. Myspace is trying to win back some of the 300 million users it once boasted… by reminding them of their Myspace days with some cringe-worthy old selfies from the last decade. MySpace has undergone its fourth major redesign in its 7 year history, as the embattled social network looks to rebrand itself and a music sharing site. The site, now part-owned by Justin Timberlake, will offer deeper integration with Facebook and Twitter. The new-look site features a minimalist photo-based design that aims to put music at the heart. Users can control audio content from a navigation panel and pair photograph albums with playlists in a kind of social media mix tape. More than two out of three Americans that were active online visited Facebook during March 2012, equalling roughly 152 million unique US visitors, according to new research. The findings, from Nielsen, found that internet audiences in Brazil, New Zealand and Italy were even more engaged than in the US, underscoring Facebook’s transcendence of borders around the world – and on the world wide web. The co-founder of Bebo has denied claims the social networking site has shut down, following the site going offline on Monday night. According to reports Bebo has been taken offline because of technical problems. Founded in 2005, Bebo was the most popular social networking site in Britain until 2007, whereupon it was overtaken by Facebook. But since it was bought by AOL in 2008 for £540 million the site rapidly lost users and value. Traffic has exploded on Google+ after the social networking site opened to the public, with its market share closing in on Linkedin and MySpace, according to new data. The study, from Web analytics firm Hitwise, saw traffic to Google+ shooting up 1,269% in one week, making the site the eighth largest social network on the Internet. The data indicates that Google+ rose from the 54th most visited site social networking to the eighth, receiving nearly 15 million visits in one week. MySpace is delaying its planned relaunch until next month, following its acquisition in June for $35m by Specific Media and singer Justin Timberlake. Specific Media had plans to unveil the website’s new vision, which was rumored to be in the realm of music and entertainment (with some sort of possible talent show element), at an exclusive summer news conference. 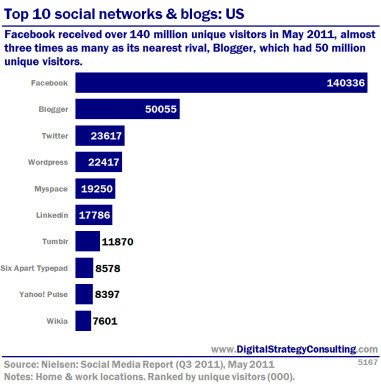 Facebook recieved over 140 million unique visitors in May 2011, almost three times as many as its nearest rival, Blogger, which had 50 million unique visitors. Facebook remains the dominant social network, but micro-blogging site Tumblr and others are enjoying traction, according to new research. The new new social media consumption study from Nielsen indicates that social network usage accounts for 25 percent of U.S. Web users' time spent online. 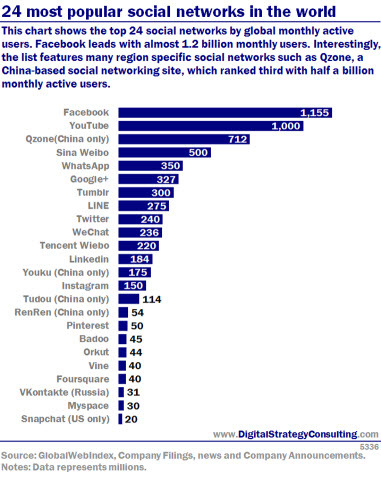 Facebook leads the way at more than 53 billion total minutes spent online during May. News Corp to sell MySpace- half of staff to go? News Corp. is on the verge of selling Myspace and a deal could include laying off more than half of the troubled social network's staff, according to a news report. The Wall Street Journal quoted a "person familiar with the matter," saying that there were two leading bidders for Myspace; digital ad-targeting firm Specific Media and private equity firm Golden Gate Capital. The News Corp.-owned Journal said a deal would include shedding more than half of Myspace's staff of about 500 people. The WSJ said the buyer would pay significantly less than the $100 million News Corp. had hoped and the Rupert Murdoch-owned company would retain a small stake in Myspace. News Corp to sell MySpace to music site? News Corp. is in preliminary talks to hand over control of Myspace to online music website Vevo.com, according to a news report. Bloomberg News reported the talks on its website Monday, citing three unnamed people with knowledge of the situation. Deal would see News Corp hand over control of social networking site in exchange for stake in new venture. MySpace is reportedly about to lay off more than half of its employees as the former social networking market leader scales back its ambitions. According to Dow Jones Newswires, the layoffs are tipped to involve around 500 people (of the site's current staff of 1000). The business hopes to continue its major strategic overhaul in a last-ditch attempt to stave off its dismal financial position. However the move could also signal the start of News Corporation’s termination of its ownership of the site. MySpace's China office has reportedly cut about 30 employees last month and saw its CEO depart, signalling the social network might be withdrawing from the market. An employee at Myspace China reported the staff cuts when asked on Monday. He would not disclose how many employees remain. A Chinese news report, however, said that about two-thirds of the staff had left the office. The Chinese version of MySpace was launched with a beta version going online in 2007. The site, however, has advertised itself more as a social networking platform for music fans. Murdoch to sell off Myspace? News Corporation is reportedly willing to sell Myspace, the former social media market leader it bought back in 2005. MySpace COO Chase Carey told Reuters that the company is open to a sale, partnership, or some other option. “There are opportunities here to do 20 things… but that doesn’t mean you’re going to do any of the 20. If there’s something there that makes sense you ought to think about it,” Carey said. Myspace’s recent redesign and rebranding efforts are an attempt to make the site more attractive to possible buyers, and Carey stuck by his position that the social networking platform had “quarters, not years” to turn itself around. “We need to deal with this with urgency,” he said today.